Glass lampworking in spades (more classes than the Gathering). Bead crochet, knitting, weaving, stringing, etc. General jewelry metal work, wirework and precious metal clay. 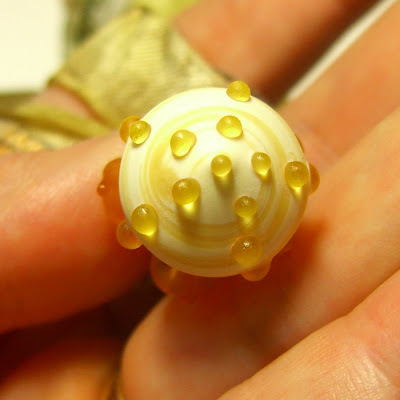 Polymer clay and faux bone. It just boggles the mind how much talent is under one roof. And when the student intake is maxed out, the shopping begins! ~500 vendors as well! Tools, supplies, beads, finished jewelry. It looks like Quilt Festival in Houston, but all bead related. My first workshop is called "Finding the Way," team taught by Robert Dancik and Louise Duhamel. In this two day workshop, we'll first make a metal clay donut, embed an image of our choice into a resin domed window, carve and color a piece of Faux Bone for the reverse, then used coldwork (rivets or the like) to join everything together. I'm especially looking forward to the resin and Faux Bone work, since I've never tried either of those. My second class is with Susan Lenart Kazmer. I recently purchased her book "Making Connections," which is just mind-boggling. She details a huge variety of cold connections: rivets, prongs, sewing with wire, tabs, etc. I particularly enjoy the narrative quality of her jewelry. 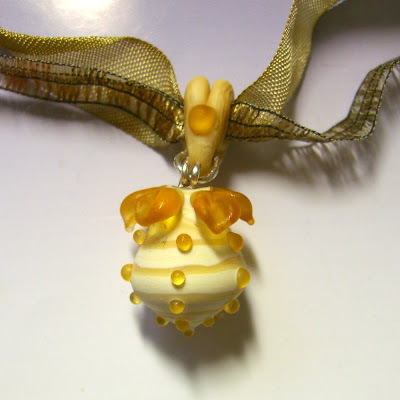 I wish I'd signed up earlier so that I could have taken her resin workshop, but that was full. The Creating Talisman Jewelry: Bracelet" workshop fit my schedule best, and I figure I'll get a good exposure to metal ideas that I can use with my glass. We're to work sheet metal and wire, add found objects, and patina metal (ah, that's good for electroforming!). Two days until I depart! End of the term homeschool tennis tournament, shower for my neice, and a Fireflies meeting, not to mention packing. I'm more concerned about tools and space for purchases than clothes! Oh Vickie, have a great time! Bead and Button is a place I have never been but it always sounds like so much fun. I've taken a few classes with Susan and they are great and you learn so much! Robert Dancik is an idea machine and a very nice guy. I met him in person once and he was one of the jury for the PMC Annual last year. What else? Buy whatever you want! Thanks for the permission, Catherine! Now I will refer DH to you when he asks "what were you thinking?!?!" Seriously, my head is in a whirl trying to decide whose booth to visit first!